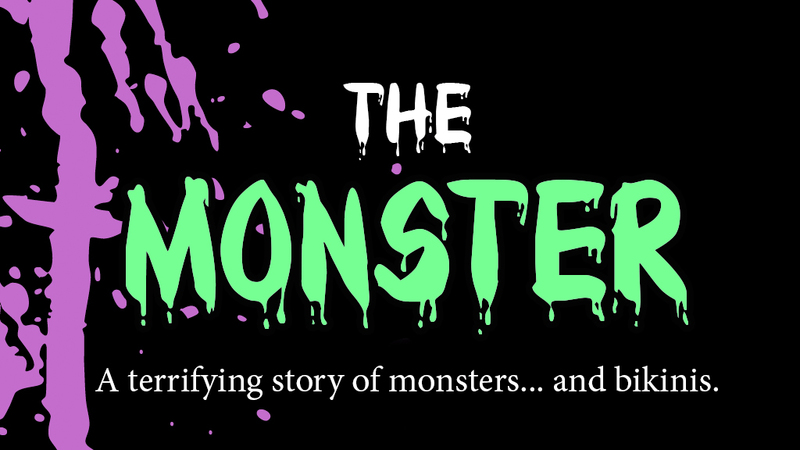 Today I have an interview with Elizabeth Chaipraditkul about her current project, The Monster, which is on Kickstarter! The Monster is an illustrated novel with a haunted house tucked inside. Check out more below! Tell me a little about The Monster. What excites you about it? 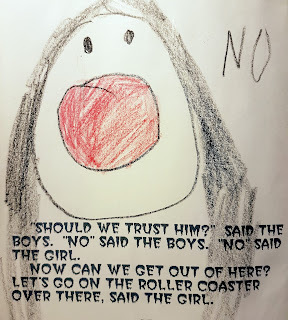 I was a really weird kid and while going through old stuff of mine my mom kept I came across a whole slew of books I created between the ages of seven and eight. I typed up and illustrated all these stories and then got my teachers to take them to the school library so they could be sewn together. 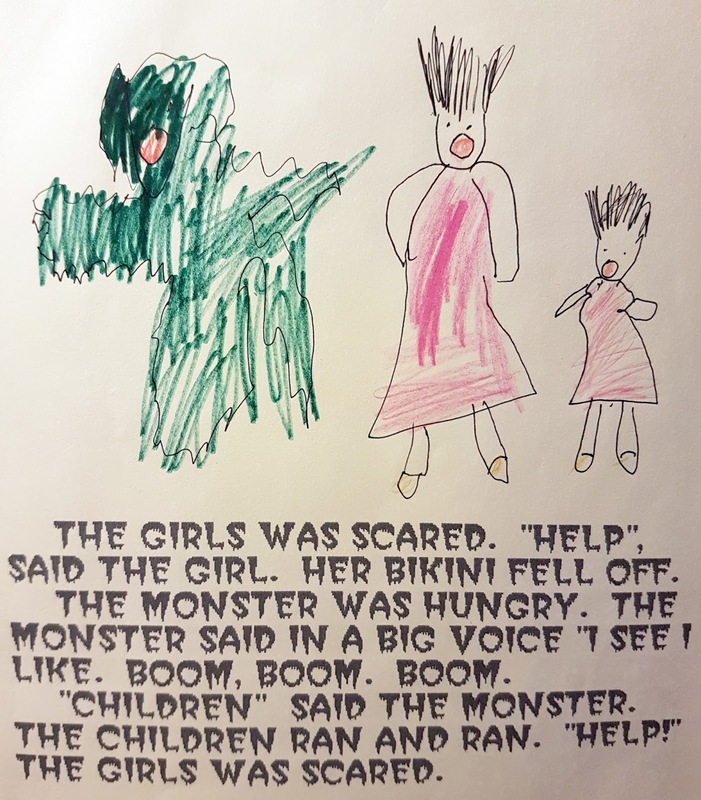 The Monster is one of these stories. Reading it back as an adult it's obvious writing was a way for me to deal with a lot of things and this story is mainly about sexuality, fear, and death. I thought it would be fun to re-write this story as an adult and get someone to illustrate it. And since I am now a big gamer, we're also turning the story into a system-neutral giant gameable dungeon. Gennifer Bone is the amazing illustrator who will be making the new image and Glynn Seal of Monkey Blood Designs will be making the maps. In the end, the book we will produce with the Kickstarter will have the original story, a new story, and an epic map with room descriptions to explore. What are the type of stories you would like players to tell in the dungeon? There is a lot you could do in the dungeon. The first, and I guess most obvious, would be a dungeon crawl - killing a bunch of monsters and getting the heck out of there. However, the dungeon is essentially one huge and weird haunted house map, so there are a lot possibility for play. It could set the scene for a really intense Monsterhearts pay session - teenage drama in a house that is trying to kill the players. Or it could be a place your coterie of vampires have to explore in Vampire the Masquerade maybe a few local neonates have gone missing and the Prince sends in the players to investigate. The red thread through all these stories is gonna be exploration and the fun is gonna be seeing what is behind every door of the house. What are some ways you explored those topics - sexuality, fear, and death - in The Monster? I've always seen the written word as something you can play around with and try out things that may seem strange or exciting. In the monster I explore the themes of sexuality, death, and fear in a few rather funny ways. When the children are faced with the monster chasing them, in fear for his mortal life one of the boys reminiscences about home and the smell of his mother's cooking. As a kid a played with the idea of death and what I would think of just before my life was snatched away from me - apparently my mom was a great cook. Likewise, in the story I toy with the ideas of sexuality and death, two concepts that have always been tied to one another in literature (albeit more elegantly than what my eight year old self could produce). I wrote about the fear of bodily exposure and what that meant to a little girl who was scared. What are you doing with the dungeon to make it system-neutral while still packing a good punch? What we aim to do is give GMs a lot of information about each room - weird things their players can find, experience, and speak to. Since the dungeon is designed to be system neutral, we are gonna make sure there is enough information for GMs to use. We'll also include a lot of random generators for the rooms (at least one for each) so the dungeon is repayable and strange. For example, we have a limb removal generator, roll 1d4, and one of your limbs falls off - perfectly intact and still moving - good luck getting it reattached. What sort of new story are you hoping to tell to accompany the original, and what themes does it bring forth? Mainly, I'd like to delve into all the information I put on each page. The original story jumps from one place to another in the truly hectic style of a kid and I would like to add some continuity. Like at one point in the story a young boy's arm falls off - it just falls off and that is about it. I'd like to go into why and how. Also, the original story is quite comical which was totally unintentional, but as an adult you just have to read it and chuckle. I'd like to add some real horror to the story, while still keeping the soul of the old story. Awesome! Thanks so much Liz for answering my questions about The Monster. If the project sounds interesting to you, my readers, please check it out on Kickstarter!